As one of the leading training providers in South Wales our learners views are essential to ensure that we maintain Torfaen Trainings facilities and learning experience to the highest standards. 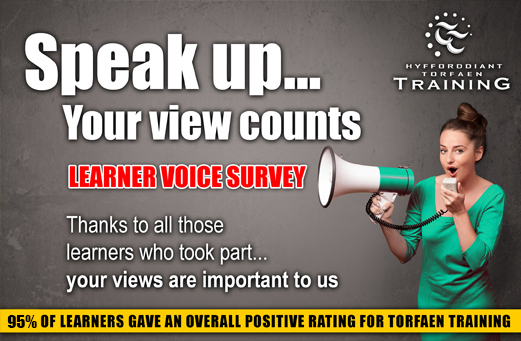 Every year we undertake the Learner Voice Survey in order to monitor satisfaction across the wide range of vocational training, commercial courses and qualifications that we provide. Learners are asked for their feedback on a wide variety of topics, from information provided to equipment available and support received. The survey results are then tabulated allowing accurate statistics to be generated so we can see the progress that has been made over the 12 month period. This year we have received large number of surveys and the results clearly reflect our high calibre of staff, excellent facilities and strong support systems that are available for our learners. At Torfaen Training we strive to ensure that the learning experience is continually improving and that all leaners all have the opportunity to voice their views about the training provided. Feedback and ideas are always encouraged to ensure standards are maintained and improved upon each year. Fab support from my Assessor Salli Moreton. I couldn't have asked for better support. Salli is very thorough and has supported me in my workplace as well as with my course work - thank you! I can’t thank Vicki Evans enough, she is an absolute asset to Torfaen Training and a wonderful assessor! The course is manageable around my work placement, this means I'm not feeling pressured like other courses have in the past. This is because the deadlines for work given to me are realistic and Kelly Sullivan is only an email away to support me whenever needed. I am constantly improving in my placement because of what I'm learning on the course. I would definitely recommend Torfaen Training to a friend. My tutor Alistair is very helpful and always encourages us to ask questions on anything that might relate to work. This helps us learn on other things that might not be covered by the course. My tutors Darren Phillips (essential skills) and Fiona Johnson (QCF) have been absolutely brilliant, very helpful and knowledgeable. I'm very pleased to have Fiona as my assessor! She answered all my concerns and made me feel less anxious about the work ahead. The course is very interesting and paced well. Holly Evans my assessor is very helpful and supportive and I don't think the course could be improved. Now that the results are available we are proud to announce that overall 95% of our learners gave us a positive rating with many areas improving on last year. This ensures a continual, progressive development programme for all our learners and future learners to enjoy.